Tuesday Night Comics Podcast Episode 100!!!! Listeners of The Billy and Bryan Show podcast (FREE on iTunes!) know that my co-host Bryan and I are a big fan of Top 5 Lists. Sadly, we’re not heading to Comic-Con to record an episode this week, but that doesn’t mean I can’t salivate over all the exclusives that are available at the show. 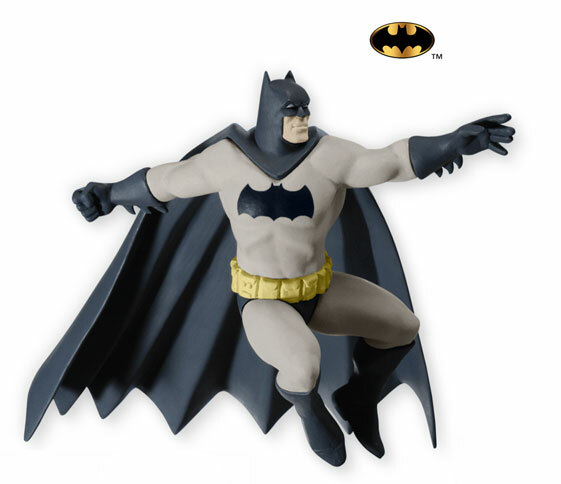 Without further ado, here are my Top 5 San Diego Comic-Con 2012 Exclusives! 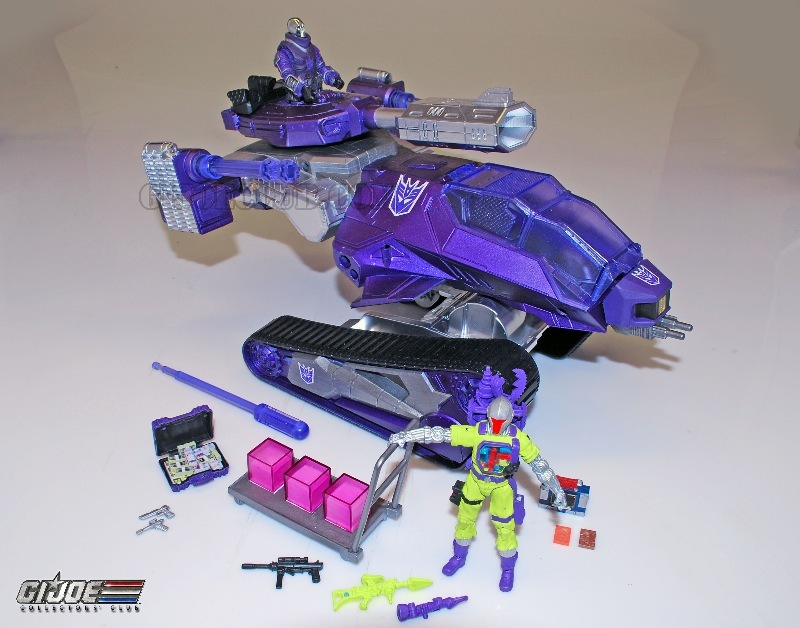 When I was a kid, Hasbro released the be all and end all of awesome toys when it sold the G.I. Joe U.S.S. Flagg Aircraft Carrier playset. It was over 7 feet long! I begged my parents for it. My mom said I had to choose between the aircraft carrier and my bed, as both wouldn’t fit in my room. I still chose the aircraft carrier. Beds are overrated. Unfortunately, they didn’t go for it. At Comic-Con this year, Hasbro is selling the Flagg’s little brother, the Super Helicarrier. It’s a little over 4 feel long and comes with action figures of Captain America and Maria Hill. How you get this home is its own adventure. I think it’s too big for the carry on bins. I haven’t seen Morgan Spurlock’s Comic-Con Episode IV: A Fan’s Hope documentary on Comic-Con yet. I think that I would like it, but what’s getting me excited for this item is that it comes with figures of Ain’t It Cool News founder Harry Knowles and Mr. Marvel himself, Stan Lee! Seriously, where else are going to get a Stan Lee action figure? 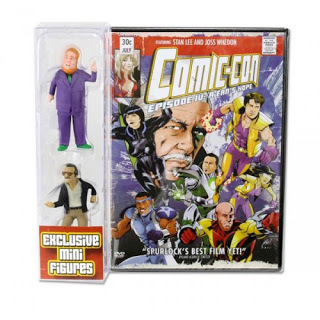 There’s another version of the DVD set with Morgan Spurlock and Joss Whedon as the included figures. I saw photos online of a Joss Whedon figure for this as well. No offense to Mr. Knowles or Mr. Spurlock, but if the figures included in one set were Lee and Whedon, this would be closer to #1 on this list. If you want to finally stage your Stan Lee vs. Joss Whedon battle, you’ll have to hunt down the version that includes all four, or buy two copies of each of the versions that includes two. If anyone asks, just tell them you want to watch the movie more than once. I’ve never been one for letter openers. I always had an easy enough time opening envelopes with my hands, so I never saw the need for one. 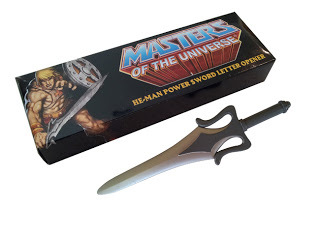 That changed the moment I saw the Masters of the Universe He-Man Power Sword Letter Opener, available at the Action Figure Express booth for $30. Yell “I have the power!” every time you open up a utility bill. Reproduced at the full size of the original comic art pages and scanned in full color, so that can see every blue pencil line and splash of white out, the Artist’s Editions by IDW are a godsend to fans of original comic art. 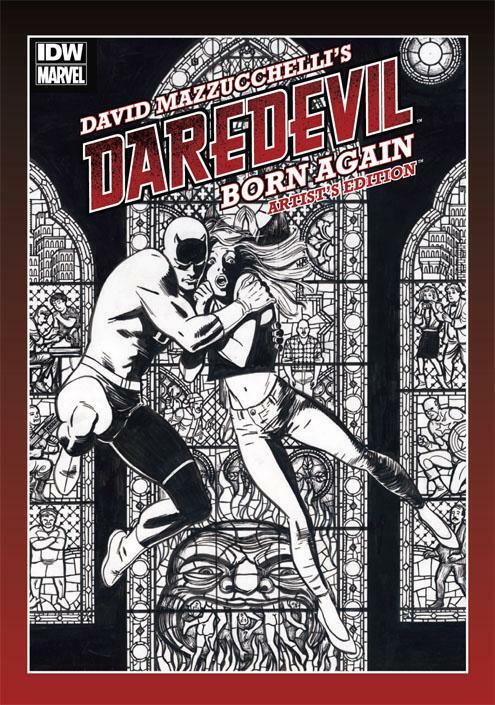 IDW has set the bar even higher with the David Mazzuchelli’s Daredevil Born Artist’s Edition. Not only has the original art been reproduced, but so have all of the overlays that ended up being taped to the original bristol board. And the book is massive. The SDCC variant is signed and numbered by David Mazzuchelli and has a different cover than the regular version. There are only 250 copies of the SDCC variant, so if you want one, make sure IDW is your first stop when you get inside. G.I. Joe was my favorite line of toys when I was growing up. Transformers wasn’t far behind. The H.I.S.S. Mark II was favorite G.I. Joe vehicle ever. Shockwave was always the Transformer that I wanted to own, but didn’t. 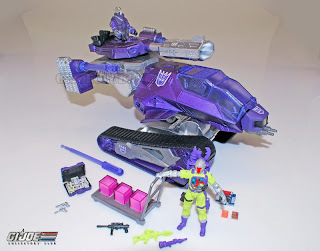 I owned Megatron, who transformed into a too-realistic looking toy gun, which was cool, but Shockwave turned into this badass futuristic laser gun that lit up. And now the H.I.S.S. and Shockwave are combined as one! The ONE downside to this tank is that it doesn’t transform. But, honestly, the only way they could have excited me more would be if the exclusive was Snake Eyes behind the wheel of G1 Bumblebee (Hint for next year, Hasbro!). I love Christmas ornaments, especially if they are Star Wars or superhero related. I also love The Dark Knight Returns. It is definitely my favorite Batman story ever. My Christmas tree will not be complete until I own this. 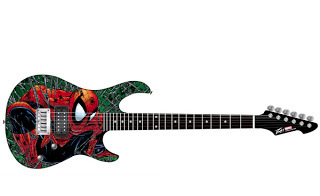 I don’t play guitar (unless you count Rock Band), but if I owned this guitar, I would learn. True story: I was obsessed with Todd McFarlane’s Spider-Man when I was in junior high school. At NYCC two years ago, 14-year old me gave present-day me a time travelling high-five when I got McFarlane to sign my copy of Amazing Spider-Man #300. At, $275, this guitar is the priciest item on this list, but look at it. It’s so pretty. The first song I would learn? The Ramones cover of The Spider-Man Theme. Looking over this list, I’m guessing that my bank account balance is very happy with me not attending Comic-Con. Here’s hoping that the exclusives at this year’s New York Comic Con are equally good! Reader Dave wanted to know where Deadpool is at in all of this. 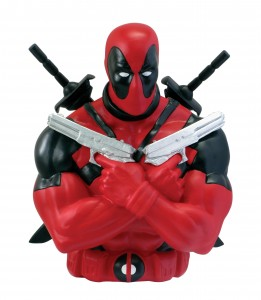 Here he is: Mongram has come out with a limited to 150 pieces Deadpool Bust Bank. It’s both sweet and generic looking. I can’t make up my mind on this one. I feel like you could get a similar Deadpool bank at your local comic book store, but the one at your local shop would be plastic and this one is a nice resin. Monogram is selling it for $25 at SDCC. Your #5 would be ALL FIVE of my entries. I had a feeling you’d like that one! Where are the Deadpool exclusives? The only Deadpool exclusive I could find is a piggybank bust by Monogram. It’s limited to 150 pieces with a price tage of $25.